Sandra Cauffman share her inspiring story with students and faculty. 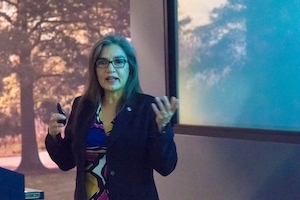 On March 22, Sandra Cauffman, NASA Earth Science Division Deputy Director, visited AU to share her inspiring story of perseverance, from her childhood in Costa Rica, to her rise through the ranks of NASA. AU student Libby Parker (BA public relations and strategic communication, minors in graphic design and marketing'18) attended the event. Here, she shares her impressions of Ms. Cauffman's talk. In 1969, when Neil Armstrong set foot on the moon and said the famous words, "One small step for [a] man, one giant leap for mankind," he inspired a young girl in Costa Rica to follow her dreams. The girl was Sandra Cauffman, who told her mother that she, too, would like to go to the moon someday. And now, nearly half a century later, Cauffman is a leader at NASA-as the Earth Science Division Deputy Director, she manages NASA's entire Earth Science portfolio, including technology development, applied science, research, and mission implementation and operation. Cauffman shared her inspiring story of perseverance with AU students and faculty as part of the College of Arts and Sciences' Bishop McCabe Lecture series. "Ms. Caufmann was an inspiration to our students and faculty alike," said Kathryn Walters-Conte, CAS Science Coordinator and Director of AU's Masters in Biotechnology. "We were all riveted by her life story, which struck a cord with nearly all of us in some way. We are thrilled that we were able to spend the afternoon and evening with such a distinguished yet down-to-earth woman scientist." Growing up in Costa Rica, Cauffman's family struggled to make ends meet. Cauffman was only thirteen when her mother became ill, so Cauffman went to work to support her family while continuing her education. With her mother's encouragement, Cauffman graduated from high school as the second best in the class, with the intention to study electrical engineering and physics. At the University of Costa Rica, Cauffman was pushed to study industrial engineering, as the electrical engineering program was not accepting women. Feeling disconnected to her studies, Cauffman shared her frustrations with her stepfather, who agreed to help her travel to the United States to pursue a double major in electrical engineering and physics at George Mason University. After graduation, Cauffman landed a contracting position at NASA's Goddard Space Flight Center in Greenbelt, MD. She served as deputy systems program director for the Geostationary Operational Environmental Satellite (GOES) program. GOES is a satellite that tracks atmospheric triggers for weather conditions such as tornadoes, flash floods, hail storms, and hurricanes, with the purpose of predicting natural disasters before they occur. "I started as a lowly instrument manager and then worked my way up to becoming the deputy division manager for the satellites within the program," Cauffman said, referencing her thirty-plus years of experience at NASA. Cauffman also served as the deputy project manager for the Mars Atmosphere and Volatile Evolution (MAVEN) mission. "By studying the planets, we can better understand earth, and by studying earth we can get a better understanding of the planets," she said. The purpose of the MAVEN mission is to determine how the red planet's atmosphere and water, presumed to have once been substantial, were lost over time. Exploring the environmental history of Mars helps earth scientists make climate change predictions about the Earth, based on the planets' similarities. As a Hispanic woman, Cauffman shared that in the beginning of her career, she felt that she had to work harder to demonstrate that she was just as capable as her male counterparts. "I would say something and they wouldn't hear me. Then a man would say the same thing, and everyone would pay attention." After working in NASA for decades, Cauffman expressed her dedication for her work, and emphasized the importance of community in the workplace. "I have worked on a number of missions and witnessed a lot of launches. But what I love most are the people I work with and the amazing teams that we have. We do wonderful things that help not only the nation, but the world." At the end of her talk, Cauffman shared personal wisdom and career advice. She encouraged the audience to follow their dreams, to explore different subjects, and to build a toolbox of skills. "Find out what you love, create your own career and fuse your interests together," advised Cauffman. Senior Jake Blumenstock (BA history and political science '18) shared his reaction to the talk and how he has fused his interests in space, history, and political science together at AU. "I appreciated that she talked about how NASA benefits us as society as a whole. One of my political science focuses is space policy and history. I firmly believe a second space race is coming." In closing Sandra Cauffman reflected on her own journey, "I had so many things thrown my way, but I knew in my heart what I wanted to too, so I stuck to it."